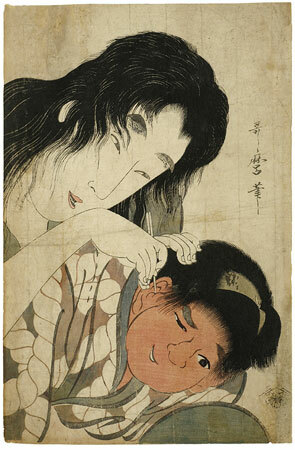 This half-portrait (hanshin-e) shows the mountain woman Yamauba holding her adopted son Kintarō, who was as strong as a bear, on her lap and cleaning his ear with a hairpin. His face indicates how unpleasant her finds this procedure. Utamaro created many depictions of Yamauba and her son, who went on to become the hero Sakata Kintoki (10th c.). They are enchanting, intimate mother and child portraits in which the wild beauty of Yamauba is contrasted with the vitality of the brown-skinned boy. This impression, although not carefully printed, belongs to the first state of the print, with the publisher’s mark in the lower right-hand corner and before the conspicuous break in the line on Kintarō’s robe which ends directly under the angle of Yamauba’s wrist. Another impression of the first state in the Philadelphia Museum of Art is reproduced in Stern, Master Prints of Japan. Impressions of the second state, lacking the publisher’s mark and with the break in the area described, but otherwise fully printed, are reproduced in Vignier and Inada, Utamaro, no. 208, and Henri Vever (Sotheby’s, London, 26 March 1975, no. 200). Yamauba is cleaning her young son’s ear with a hairpin. The distorted grimace on his face makes one wonder if perhaps Utamaro was contrasting a certain kind of female beauty with a certain kind of childish ugliness, in the same way that in earlier prints he had contrasted the elegance of ukiyo-e style women with Kanō grotesqueries of the Lucky Gods. At any rate, very few of the pictures of Kintarō betray any of the sympathetic charm that seems to appear so frequently and spontaneously in many of Utamaro’s other children.